Copyrights and Permitted Use: Our website is owned and operated by us. Unless otherwise specified, all materials appearing on our website, including the text, site design, graphics, logos, icons and images, as well as the selection, assembly and arrangement thereof, are the sole property of FlyingRoses.com. You may view, download, print and retain a copy of pages of our website only for your own personal use. Except as expressly provided above, you may not use, download, upload, copy, print, display, perform, reproduce, republish, license, post, transmit or distribute any information from our website in whole or in part without our prior written permission. We post legal notices and various credits on pages our website. If you duplicate, publish or otherwise distribute material on our site, you may not remove these notices or credits or any additional information accompanying such notices and credits. Copyright Policy: We may terminate the privileges of any user who uses the site unlawfully to transmit copyrighted material without a license, express consent, valid defense or fair use exemption to do so. If you submit information to the website, you warrant that the information does not infringe the copyrights or other rights of third parties. Representations by You: By visiting this website, you represent and warrant that (a) you are at least 18 years old; and (b) that all materials of any kind submitted by you through the website or for inclusion on the website will not plagiarize, violate or infringe upon the rights of any third-party including trade secret, copyright, trademark, trade dress, privacy, patent, or other personal or proprietary rights; (c) and also agree not to use our website or any content contained in it for any illegal or inappropriate activities. Accounts: During the registration process you will be asked to select a unique password for access to certain portions of the website. You are responsible for maintaining the confidentiality of the password and account, and are fully responsible for all activities that occur under the password. By logging into the website, you represent and warrant that: (i) you are the customer who registered for the services; (ii) that you are using the services only for permitted purposes; (iii) you are not a competitor of FlyingRoses.com, or agent thereof; (iv) you will immediately notify us of any unauthorized use of the password or account or any other breach of security; and (v) you will ensure that you exit from your account at the end of each session. Please notify us of any potential unauthorized use(s) of your account, or breach of security. You also represent and warrant that: (i) you will not select or utilize a user name of another person with intent to impersonate that person; (ii) you will not select or utilize a user name in which another person has rights, if you do not have that person's authorization to use such name; and (iii) you will not select or utilize a user name that Provide Commerce in its sole discretion deems offensive. Typographical Errors: In the event a product is listed at an incorrect price or with incorrect information due to typographical error or error in pricing or product information received from our suppliers, we shall have the right to refuse or cancel any orders placed for products listed at the incorrect price. We shall have the right to refuse or cancel any such orders whether or not the order has been confirmed and your credit card charged. If your credit card has already been charged for the purchase and your order is canceled, we shall immediately issue a credit to your credit card account in the amount of the charge. Violation of the Terms and Conditions: By using our website, you understand and agree that we, at our sole discretion and without prior notice, may terminate your access to the site and to any services offered on the site, and may remove any content you have provided ("User Content") if we believe that the User Content violates or is inconsistent with these Terms and Conditions or their intent, that your conduct is disruptive, or you have violated the law or the rights of FlyingRoses.com or another user. Feedback: We welcome all comments, feedback, information, or materials ("Feedback"), which you submit to us by email. 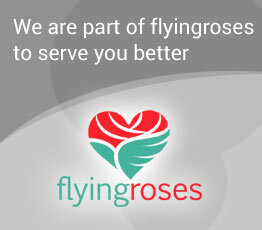 Please note that Feedback shall be considered non-confidential and become the property of FlyingRoses.com. By submitting Feedback to us, you agree to a no charge assignment to us of all right, title and interest in copyrights and other intellectual property rights on a worldwide basis to the Feedback. We shall be free to use Feedback on an unrestricted basis. 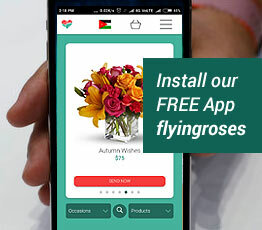 Guarantee and Disclaimers: Flying Roses Inc guarantees that its flowers, plants, and preserved items ordered on FlyingRoses.com website will be fresh for at least seven days after delivery. With respect to either of our guarantees, our sole maximum liability will not be more than to refund the purchase price or to replace and deliver equivalent product items, as appropriate, as soon as reasonably possible. The applicable guarantee must be brought within (30) days after delivery or we shall not be liable and you will have waived any and all related claims regarding such product items. Our website and the materials therein are provided "as is" and "as available". We do not promise that our website or any services offered on our website will be error-free or uninterrupted. Limitation of Liability: YOU AGREE THAT, EXCEPT AS EXPLICITLY SET FORTH HEREIN, FLYING ROSES INC, ITS DIRECTORS, OFFICERS, EMPLOYEES OR OTHER REPRESENTATIVES SHALL NOT BE LIABLE FOR DAMAGES RELATED TO PRODUCTS SOLD OR THE OPERATION, CONTENT OR USE OF OUR SITES. YOU AGREE THAT THIS LIMITATION OF LIABILITY IS COMPREHENSIVE AND APPLIES TO ALL DAMAGES OF ANY KIND, INCLUDING WITHOUT LIMITATION DIRECT, INDIRECT, COMPENSATORY, SPECIAL, INCIDENTAL, PUNITIVE AND CONSEQUENTIAL DAMAGES, DAMAGES FOR LOSS OF PROFITS, REVENUES, DATA AND USE, INCURRED BY YOU OR ANY THIRD PARTY, WHETHER IN AN ACTION IN CONTRACT OR TORT, RELATED TO OUR PRODUCTS OR YOUR ACCESS TO, AND USE OF, OUR WEBSITE OR ANY OTHER HYPER-LINKED THIRD PARTY WEBSITE, EVEN IF WE HAVE BEEN ADVISED OF, OR ARE AWARE OF, THE POSSIBILITY OF SUCH DAMAGES. Advertising: The site may contain advertisements and/or sponsorship. The advertisers and/or sponsors that provide these advertisements and sponsorship are solely responsible for insuring that the materials submitted for inclusion on the website are accurate and comply with all applicable laws. We are not responsible for the acts or omissions of any advertiser or sponsor. Applicable Law: You agree that any legal action brought against us shall be governed by the laws of the Republic of Lebanon, without regard to conflict of law principles. You agree that the sole jurisdiction and venue for any litigation arising from your use of or orders made on our website shall be an appropriate court located in Lebanon. Indemnity: By using our website, you agree to indemnify and hold Flying Roses Inc, its subsidiaries, affiliates, officers, agents and other partners and employees, harmless from any loss, liability, claim or demand, including reasonable attorneys' fees, made by any third party due to or arising out of your use of such Site, including providing a link to another site or uploading any content to such Site. How to Contact Us: If you have any comments or questions, please do not hesitate to contact us at [email protected] or at +961.76.664406, or write us at: 1st floor, Block B, Tayyar center, General Charles de Gaulle avenue. Sin El-Fil (Metn) P.O.Box 55-654, Lebanon. Our help desk is manned Monday- Sunday 9:00am to 9:00pm, at busy times or outside these hours please use our above email and we will make sure to reply as soon as possible. To serve you better and faster, if you wish to contact us about an existing order, please quote either the order number or the billing address email.